A reference to collaborative Southwestern archaeological excavations of the early 20th century completed by Harvard’s Peabody Museum of Archaeology and Ethnology in conjunction with the Smithsonian Institution. These excavations include sites such as Mesa Verde and Pueblo Bonito, among others. The Peabody Museum of Archaeology is a museum associated with Harvard University in Cambridge, Massachusetts and funded excavations in archaeological sites throughout the U.S. Similarly, the Smithsonian backed many large excavations in the Southwest. The Smithsonian is a private institution that is in the trust of the U.S. government and funds museums, research centers, libraries, and more. 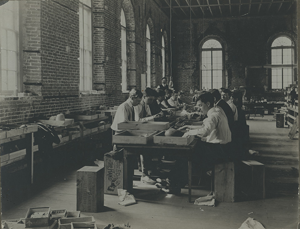 The Smithsonian is based in Washington D.C.
"Students working at the robert S. Peabody Museum of Archaeology, circa 1920" by Phillips Academy Archives and Special Collections is licensed under Public Domain. N.d. Smithsonian Institution. http://www.britannica.com/EBchecked/topic/549980/Smithsonian-Institution, accessed January 15, 2015.